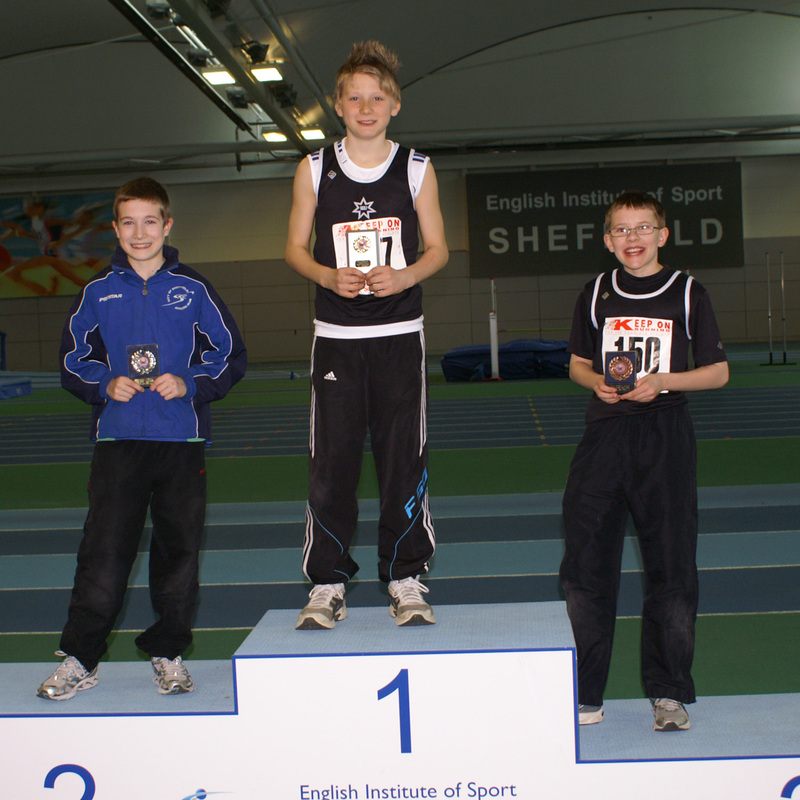 With the end of the summer athletics season attention turns to indoor competition and, in this area that means the South Yorkshire Indoor grand Prix Series for athletes from 8 to 15 years old, held in the world class facilities of the EIS in Sheffield. Now in its fifth year this competition has gone from strength to strength and this year attracted athletes from as far afield as the Scottish borders and Berkshire in the South of England. Every year the numbers seem to grow and fields of almost 60 athletes in some events stretch the facilities and the organisers to the full. Thirty five young Harriers pitted their skills against some of the best junior athletes competing and Grace Harris took the honours for the cub as she took the prize for the Girls 11-13 800m and provided the club with its only winner of the day. Nyah Barlow came close to emulating her as she was touched off by only 14 hundredths of a second in the Girls 8-11 600m and Annabel Johnson underlined the strength of the Harriers middle distance athletes as she took second place in the Girls 13-15 800m in an excellent time of 2.37. Olivia Wood was the third Rotherham Harrier to take a score a second place finish as she was runner up in the Girls 11-13 Shot Putt. Rhys Butterworth showed excellent form for the club with 3rd place finishes in the Boys 8-11 60m and 150m and he capped off a very successful day with 8th place in the Long Jump. Ryan Viggars gained a place on the podium with 3rd place in the Boys 11-13 Long Jump and also ran into 4th place in the 60m and 7th in the 200m. Bradley Ellison was another athlete in good all round form with 3rd place in the Boys 13-15 60m , 5th place in the Long Jump and 7th place in the 200m. Bronte Rennocks completed the clubs medal tally with a 3rd place in the Girls 11-13 200m, completing another good series with 4th in the Shot Put and 12th in the Long Jump. A total of 1 gold medal place, 3 silver and 5 bronze was an excellent return for the club in such a competitive arena. With all performances scoring points towards the final grand prix positions and each athlete able to compete in a maximum of 3 events many of the young Harriers took the opportunity to try out unfamiliar events and this can only benefit the club in the coming season as new talents are unearthed. Nyah Barlow Shot (4th), L J (12th); Katie Viggars 150m (8th), 60m (9th)L J (17th); Abigail Kerr Shot (7th), 150m (19th), L J (2nd); Oluchi Idaboh 150m (9th), shot (9th), 60m (20th); Katie Hough 150m (11th), 60m (25th), LJ (25th); Marni Harris 150m (12th), 60m (21st), L J (29th). Alex McEwan Shot (7th), 800m (10th), L J (32nd); Ben Frost 60m (10th), 200m (13th), L J (31st); Ross Birks Shot (15th), 60m (30th), L J (33rd). Keiva Rennocks 800m (5th), L J (5th), Shot (6th); Melissa Coxon Shot (7th),60m (13th), 200m (7th); Olivia Wood 60m (8th), L J (22nd); Abby Stroughair 800m (12th), shot (14th), L J (45th); Leah Hayward 800m (16th), 200m (26th), L J (50th); Ciara Mullane 800m (20th), 60m (24th), L J (28th); Jessica Pink Shot (22nd), 200m (31st), L J (48th). Dalitso Daka 60m (5th), 200m (9th); Elliott Warhurst Shot (7th), L J (10th), 60m (15th). Sarah Zintchem 200m (5th), 60m (6th), 800m (13th); Ellie Booker 60m (5th), 200m (11th), L J (26th); Louise Oak 800m (5th), 200m (37th); Phillipa Hartley 200m (13th), L J (39th), Annabel Johnson 200m (26th), L J (43rd); Sophie Oak 60m (26th), 200m (31st), L J (52nd); Cyane Robinson 60m (28th), 200m (30th), L J (35th); Mia Harris 200m (28th), 60m (31st), L J (40th); Kelsey Noble L J (31st), 200m (32nd); Ellie Guy 60m (32nd), L J (38th); Georgina Bradford 60m (34th), 200m (36th), L J (41st); Charlotte Kerr L J (36th), 60m (42nd), 200m (42nd).